One of the wonderful attributes of chocolate, and I mean good chocolate, is that it has the ability to be absolutely perfect for just about any of life’s occasions. Whether it acts as a salve after crazy-hectic weeks at work, or the exclamation point to mark life’s wonderful celebrations, or just the last essential piece to a gloomy-day-in puzzle…or even as a earnest offering for having been away from this blog for a while! And if it acts as all four? Why then, use four times the chocolate! I had bookmarked this famous (infamous) recipe by the Domestic Goddess herself a while back when spied it over here. There is nothing really more to say than I saw all the chocolate, and I was smitten. I’ve read the good (glorious!) reviews and I’ve also read the bad (doesn’t cling-film melt?) reviews. But so far, Nigella has not let me down. And this cake was no different. – Bring all ingredients to room temperature. – Pre-heat your oven to 170C and stick a baking sheet in. Grease a loaf tin (21 x 11cm and 7.5cm deep) and line it with parchment paper. Leave a little bit of parchment to extend beyond the tin so that you will have something with which you can easily lift the cake out of the tin later on. – Put the flour, baking soda, cocoa, sugar, butter, eggs, vanilla, and sour cream in a processor and blitz until it is smooth and satiny. Scrape down with a rubber spatula and process again while pouring the hot water down the funnel. Switch it off, remove the lid and the blades, and then fold in the chocolate chips. – Pour the batter into the prepared tin and bake in your pre-heated oven for 1 hour or until a cake tester comes out pretty clean…there may be stickiness as this is a damp cake and that is totally fine. – When you still have about 10-15 minutes left of baking time on your cake, get started with the syrup. Put the cocoa, water, and sugar in a saucepan and boil for 5 minutes or so. You want a reduced, syrupy liquid that is still pourable. – When the cake is done, place the tin on a rack and pierce the cake here and there with a skewer. Pour the syrup as evenly as you can over the cake. – Once the cake is completely cooled, take it out of its tin (just pull it out with the parchment overhang you so carefully crafted), peel off the parchment, and place it on a serving platter. 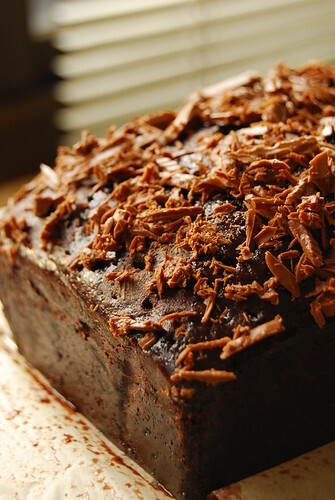 Now take your bar of chocolate and cut it into flakes and splinters and scatter all over the top of the cake. I used milk chocolate for the topping because the cake was already dark chocolate all throughout and I was taking this to a friend who is more a fan of milk than dark. 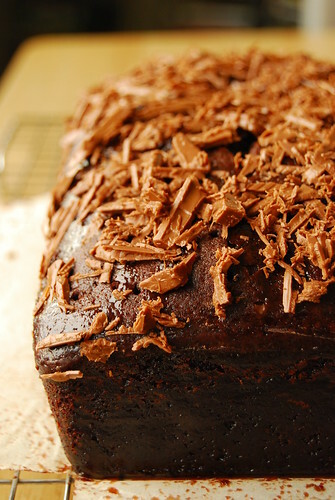 You can also try topping with chocolate before the cake cools down so the chocolate shards melt a bit…MMM! Let me take a moment here to just say: I really prefer weighing ingredients over fiddling with measuring cups! Weighing your ingredients is not only more precise, it is a whole lot easier! Especially if you have to do the washing up. Imagine a world where you never have to wash those darn measuring cups. That is the world of the scales my friend. I am sold on adding boiling water to the batter as I did in another of Nigella’s cakes here. It really produces an enchanting crumb! Soft, tight, rich, but light. And despite the quadruple-ness of the chocolate, the cake just holds itself back from being over the top…stopping at being a lovely, luscious, comforting chocolate cake. Ummmm……this just sounds and looks amazing! I can't wait to give this a try on my own. SO glad I found your blog, so many of these recipes have been making me salivate. I'll be back for more!